Faculty of «International Relations and Regional Studies» was founded on the basis of Faculty of the «Regional Studies and Translation» in 12 October 2004. The mission of the Faculty is an effective organization of training on «International Relations» and «Regional Studies» specialties, improving the quality of personnel training, also system at sation of scientific, scientific-methodical researches. 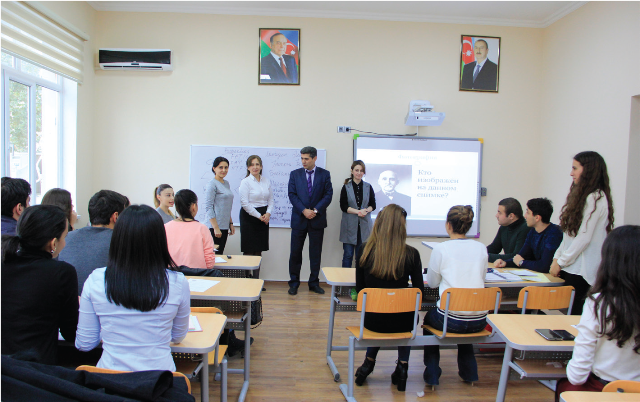 Admission of the students on the speciality of «Regional Studies» started in 1999 and on the speciality of «International Relations » started in 2001. The first graduates of the faculty were on bachelor degree on the speciality of «Regional Studies» in 2003 and on the speciality of «International Relations » in 2005. For the first time, Departments of «International Relations», «Political Science and Economics», «Slavic Philology» and «European Studies» were subjected to the new Faculty. Later on, Department of «Political Science and Economics» was transferred to the University and Department of «Diplomacy and Foreign Policy» was established in 2008. The teaching staff of the faculty includes about 4 doctors of science, professors, about 17 candidates of science and associate professors and more than 42 leading lecturers and teachers. The management of the University has established a range of scientific, educational and culture centers, e.g. Today, there are about 600 students studying at the faculty. Within 2004-2015 more than 100 students from this faculty enrolled in the universities of Turkey, Poland, Czech, Russian, Ukraine, Bulgaria, Greece, UK and etc, with different timing schedule basis. The aim of the faculty of International relations and Region study is to prepare specialists who can present the world policy, being able to analyze thoroughly and have necessary theoretical and practical knowledge skills and habits as highly-qualified specialist. These specialist have the ability of highly-leveled intellect and analytical thoughts, at least having the skills of studying a foreign language. The knowledge and skills of faculty postgraduates makes chances to continue their activity not only in the country, but also abroad, as well. Beside supporting the diplomatic specialists resources of the independent Azerbaijan Republic, they can work in some local and international organizations, strategically identification centers, executive and legislative state bodies as specialists and advisers.